Jr. Iron Chef Mise en Place Winners! 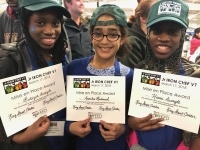 Congratulations to our determined, disciplined City Market sponsored-team from King Street Center who successfully competed in the Jr. Iron Chef competition earlier this month. They won the Mise en Place award, meaning, "Everything in its place." Rukiya, Hawa, and Annika exhibited all that we celebrate in our Teen Futures program every single day - practicing new experiences until they become part of your life's tool kit.